The 380th Bomb Group (Heavy), operating from the Northern Territory, set record after record for missions of long distance, none of which were turning points in the war, and received little or no recognition in the press at home. We were simply operating in a little known area of the world (ask anyone to name more than one of the Dutch East Indies Islands) and as a result was a sideshow at best. The Dutch East Indies' area is large, covering an area of the globe's surface about equal to the United States in an East-West and North-South direction. The area extends from about 95 degrees east longitude to 135 degrees east longitude and the area sits astride the equator extending 10 degrees of latitude to each side. Beginning in the late 1600s, and from then on, the Dutch and Portuguese sea explorers staked out their claims around the globe. In the Dutch East Indies, as the name suggests, the Dutch had it very much their own way, with the Portuguese only gaining one-half of the Island of Timor, the one nearest Australia; all the rest were held by the Dutch. The islands were full of riches: spices, lumber, petroleum, vegetable oils, minerals, sea food, hand-crafted cloth and artwork, and many more things. The Dutch let the natives govern themselves and did not attempt to impose Western culture upon them. The religion was Muslim, a God-fearing creed, and in general there was a large measure of civil order. The Dutch only wanted to make and manage the money! The area had, at the outset of the war, only token military defenses and were almost powerless to stop the Japanese invaders. The Japanese overran British territories also. The Japanese could not sustain a war effort for very long without being resupplied with raw materials from Southeast Asia and the Dutch East Indies. It was the job of the 380th to make business as usual as near as impossible as we could for the Japanese. Looking at the record, I think what we did was evident in many ways. As a first order of business, we had to keep the enemy out of Northern Australia as all the evidence was they intended to take Australia. The Japanese Airforce was based in strength in Timor and they pounded the Port of Darwin into rubble. There wasn't much to pound, but they did a good job of it. So when the 380th entered the Northern Territory, we had to be hidden as it were back from the coast in the "Outback." As the 380th Group's mission began to get the attention of the Japanese, they came after us twice with daylight bombing raids. The first was a total surprise. Friendly observers on the coast alerted us to the oncoming enemy bomber formation. They were very high, maybe 20,000 feet, and while the Aussies had some anti-aircraft guns in place, they were more token than anything else. 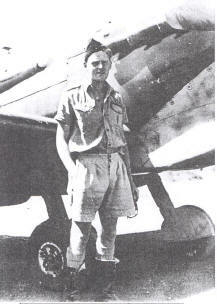 There were also some Aussie Spitfires based in Darwin, 100 miles north of Fenton; maybe two or three. We were really betting the Japanese couldn't hit the broad side of a barn. The bet was largely a winner. No one was killed; no craters in the airstrip; no aircraft damaged; no hits in the living area, but the fuel dump caught a couple of direct hits, followed by some fireworks! The all-alert siren sounded; we grabbed our helmets and raced for the shallow foxholes we had previously dug. There crouched down, so as to make as small a ball of our bodies as possible, we waited. The enemy was so high the engines could hardly be heard. Then the Aussie ack ack began to fire; blam!, blam!, blam! The sound of the ack ack was reassuring, but as we peeked up we didn't see any bombers coming down in flames. Then we could hear the scream of the falling bombs and scream they did, just like in the movies. Every screaming bomb had a person's name on it, or so we felt. The bombs then would strike: ba-room!, ba-room!, ba-room! And the earth would shake. A 500-pound bomb strike one-fourth a mile away leaves the impression it exploded next door. In less than 10 minutes, the raid was all over and the all clear was sounded. Now we were greeted by an emergency call for all hands at the fuel dump which had been hit. The aviation fuel was stored in 55-gallon steel drums, stacked up like cord wood, 20 or more feet high. I never understood how anyone stacked them so high or had planned to get them down. The fire started by the bomb hit had set some of the barrels afire and one would ignite another, and another, and another until the entire dump threatened to explode in one gigantic ball of fire. Exploding drums would be hurled 100 feet into the air and the ends would be blown off; the 20-inch diameter steel ends flying across the area like a Frisbee, ready to decapitate any head in its path. "All right you guys, let's get at it, start rolling those drums away from the fire!" The fire was so large and intense, just to approach it was a searing experience, but approach it we did and rolled those unburned drums away, some so hot they almost burned our hands. I wondered if we'd be awarded the Purple Heart if one of those hot flying Frisbees took our head off! In a few hours, the fire was under control, make that more like burned out, because we had rolled the barrels to a safe distance. Mark the end of one bombing raid! The second time the Japanese came over, a couple of Spitfires got after them and the bombs dropped wide of the target, us! The falling bombs still made a terrifying noise and the ground still shook. One of the Spitfires hit a bomber and it began to trail smoke, dropping out of the formation to finally crash somewhere in the Outback. The initial mission planning strategy for the 380th Group was to neutralize the Japanese threat on Timor. We plastered their air bases and left them in ruins and kept them unusable with an occasional raid to keep the runway full of craters. At first, the Japanese put up fighters in resistance and they were very capable, but then so were ten 50-caliber machine guns on every bomber. Timor never ceased to be a threat to our boys as they returned from those long missions. To give Timor a wide berth required some dog legs in the flight path, and that burned extra fuel that wasn't available, so they always came as close to Timor as they dared. We had some super heroes in the 380th, but then it is supposed that every outfit can make the same claim. Uncommonly brave behavior on those long bombing raids deep into Japanese territory became common after awhile. They were recorded in the story of the Group as written by a group of the Intelligence Officers at the close of the war. I often re-read it, if for nothing else than to remind me there were some great men who made great sacrifices so that I could return home! They shall never be forgotten!